How to calculate the video frame size? This video frame size calculator is a handy tool for determining the data size of an uncompressed video file. All you have to do is provide the resolution of your video and its color depth. 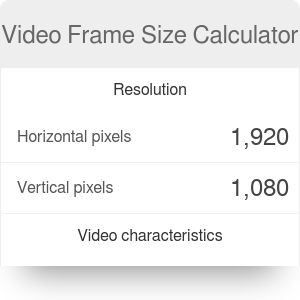 If you want to calculate the file size of a video that uses a particular compression standard, such as H.264 or HEVC, take a look at the video file size calculator. A video frame is one of many images that the whole "moving picture" is comprised of. The data size of such an image depends on several parameters. First of all, the size of a frame is connected with the resolution - the number of pixels that can be displayed. Resolution is usually expressed as the number of pixels in the horizontal and vertical dimensions. Each pixel is a piece of data to be saved; thus, the better the resolution, the bigger the frame size. Secondly, the frame size depends on the color depth. This phrase means nothing else than the number of bits used to indicate the color of each pixel. For example, in 8-bit color depth, each pixel can have one of 2⁸ = 256 colors. If you choose to have a 16-bit color depth, you can encode 2¹⁶, that is 4096 different colors. The higher the color depth, the bigger the data size of every pixel. If you use 8-bit colors, each pixel has to store 8 bits of information (equivalent to 1 byte). 16-bit colors need 2 bytes of information per pixel, 24-bit need 3 bytes. CD is the color depth. fps is the number of frames displayed per second. This number can range from 12 fps to even 60 fps; the most common value, however, is 24 frames per second. Professionals tend to use compressed videos to decrease the video file size. Compression can be lossless (only redundant data is removed) or lossy (less important information is removed). In practice, lossy compression is much more common - compromising on video quality is necessary in order to ensure lower data sizes. Interested in video editing? Try our timecode calculator! Video Frame Size Calculator can be embedded on your website to enrich the content you wrote and make it easier for your visitors to understand your message.